Chinese American Verse from Exclusion to Postethnicity. Oxford, New York: Oxford University Press, 2010. 336 pp. Foreign Accents marks an admirable effort by Steven G. Yao to rejuvenate the study of Asian American literature, particularly the study of poetry. The book covers the period from the Exclusion era to the present, focusing on the development of the concept “Asian American” as a racial and literary category and especially its contested meanings in the discourse of liberal multiculturalism. While the study of other genres such as fiction and film in Asian American literary production has experienced healthy growth in recent times, Yao makes a convincing case for Chinese American poetry as a representative and unique voice of Asian American ethnic subjectivity in the context of American literature. Yao’s choice of texts is an eclectic mix, from Ezra Pound and the anonymous poets on Angel Island to the contemporary writers Ha Jin, Li-Young Lee, Marilyn Chin, and John Yau. These are not selections one would commonly find in any popular anthology of Asian American literature–evidence of the author’s novel approach to the subject. Furthermore, this selection of poets serves Yao’s purpose of uncovering the figure of China in America’s poetic imagination. 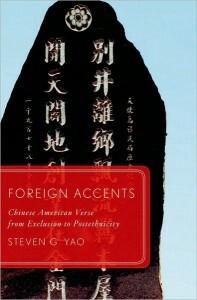 Sometimes historical, but more often linguistically oriented, Yao focuses on describing the rhetorical and formal strategies of poets who use the figure of China to construct an alternative articulation of race and subjectivity through the creation of cross-cultural and ethnic texts that challenge the dominant (Anglo-European) American literary tradition. Yao contends that “racial protest,” “lyrical testimony,” and “ethnic abstraction” are three major modes of expression in Asian American verse, and their manifestation in various poems comprises the thrust of his reading and analysis. Not satisfied with simplistic critical claims of “hybridity” in Asian American literature, Yao intends to offer a “more subtly nuanced critical vocabulary” (21) for taxonomizing hybridity, one that enriches rather than limits the texts in question. Clearly, despite his theory-heavy language, Yao’s interest is not in offering a narrative of aesthetic themes and positions shared among the poets but in presenting an analytical model of reading to illustrate formal differences among poets and texts in Asian American verse as a field of cultural production. The book consists of two sections with an “interchapter” as a dividing marker. The first section explores two cases of poetic expression from the first half of the twentieth century–Ezra Pound’s Cathay and the Angel Island poems. Yao approaches these works via a historical framework that accomodates both as precursors to Asian American poetry. Chapter 1, “Toward a Prehistory of Asian American Verse,” affirms Ezra Pound’s foundational role in modern poetry because of his engagement with different East Asian cultural forms and practices as a whole and with Chinese culture in particular. Pound’s Cathay, well known for its “fundamental or essential insight into the ideals, forms and experiences of the Chinese literary tradition and subjects,” is still considered a very important protocol in “reconfiguring the very conception of Chinese culture” (41) by many American writers today. Alhough Yao does not offer much new insight into the individual poems in Cathay, his unique take on Pound as a cross-cultural icon who introduced “the poetics of Chineseness” into the “high literature” of the West is noteworthy, because in doing so Yao presents a framework for understanding Pound’s lasting influence on the evolving integration of China and Chinese poetry into the American literary landscape. In Chapter 2, “Chinese/American Verse in Transnational Perspective,” the author finds an internationalist dimension in the Angel Island poems, a reading that goes well beyond the conventional view of the poems as historical and social documents. Yao points out that the poems not only reflect the pain, anger, agony, and collectivized racial protest of immigrants from a “weak” nation, they also mirror the pathologization of Chinese identity in the discourse of the Exclusion era. By placing them in the current larger context of globalization and liberal multiculturalism, the Angel Island poems, perhaps much in the same way as the Cathay poems, come to cross boundaries of nationality, culture, and language. More important, the singularly Chinese experiences collected in these anonymous poems and embodied in traditional Chinese verse speak to other minorities in the United States in their expressions of loss, estrangement, dislocation, and marginalization. The Interchapter “From the Language of Race to the Poetics of Ethnicity,” which surveys the rise of Asian American verse in the wake of the Civil Rights Movement and the uncertain meaning of ethnicity in literary representation, serves as a transition into the four case studies of contemporary Chinese American poets that constitute the second section of the book. Chapter 3 “A Voice from China” focuses on Ha Jin, a prolific writer better known for his fiction than for his poetry. Yao’s insightful reading of Ha Jin’s three published collections of poems highlights the “specific ideological functioning” (110) embedded in these works and through which Ha Jin mercilessly exposes the hypocrisy of socialism in China during the Cultural Revolution by recording experiences of trauma and absurdity in Chinese people’s daily lives. Ha Jin has been enthusiastically embraced as an “American writer,” but his entire body of work employs English in the creation of explicitly Chinese characters and themes. Unlike most critics of Asian American literature who are reluctant to embrace Ha Jin as part of their scholarly purview, Yao sees this irony as a disruption to Eurocentric characterizations of American literature in general and conventional conceptual and referential categories of Asian American literature in particular. The subject of Chapter 4 “The Precision of Persimmons” is Li-Young Lee, arguably the most exciting Chinese American poet today. In a selected reading of Lee’s work, Yao locates the poet’s mode of lyrical testimony, conducting a “dialogue with his truest self” (147) by connecting with a Chinese familial and cultural lineage. However, Yao also finds that Lee’s type of “memory project” often slips into the pitfall of essentialism and the question of authenticity in the construction of an ethnic experience, as is often seen in Asian American fiction. In Chapter 5, Yao considers Marilyn Chin a more “substantial” Chinese American poet for her avowed political agenda and, more important, for her attempt to contest the conventional poetic decorum in ethnic versification. Chin’s innovative incorporation of Chinese language and cultural practices into her poetry, according to Yao, transgresses the “coercive mimeticism” common to ethnic representation and gives voice to an emerging Chinese American women’s consciousness that embraces both ethnicity and feminism. At her best, Chin’s formal techniques of cross-fertilization and transplantation manage to represent Chinese “difference” in a way that foregrounds specific cultural practices and historical materials to account for their presence in Chinese American lives and to minimize the appeal of exoticism. Yao’s declared privileging of formal strategies over thematic representation can be seen in his obvious admiration for John Yau in the book’s final chapter. Specifically, he finds the presence of a “counterpoetics” in John Yau’s work that is fueled by a powerful anti-essentialist impulse: it parodies Asian figures and traditions for the purpose of challenging conventions and boundaries. The poet conducts what Yao calls “ethnic abstraction,” a mode that may represent the future of Asian American verse. There is no doubt that John Yau demonstrates brilliant inventiveness in formal strategies that help to destabilize the concept of identity and question the very articulation of minority difference under the auspices of liberal multiculturalism. However, [Steven] Yao’s deployment of the term “ethnic abstraction” to elucidate how [John] Yau’s innovations are designed to refuse “a unified ethnic subject” befuddles more than it clarifies. Leaving aside the question whether we are already in a post-racial society and whether ethnicity is no longer a meaningful category, to hopefully anticipate the future of Asian American verse in a poet who only gingerly acknowledges his ethnic consciousness as a writer and who insists upon diffusing the meaning of ethnicity through a non-representational poetics is a curious ending to a study of Chinese American poetry. Interestingly, in the brief “Conclusion,” Yao questions the very idea of “postethnicity” and makes it clear that the reason for his advocacy of John Yau and Marilyn Chin is because they demonstrate ethnicity as a discursive construction and their textual strategies offer “alternative configurations of minority identity and difference” in contemporary America. Such issues aside, Steven Yao’s Foreign Accents: Chinese American Verse from Exclusion to Postethnicity deserves high marks for its sophisticated theoretical approach and meticulous research. The author’s original readings of the four contemporary Chinese American poets may do far more than merely address a gap in the scholarship: they may well become indispensible for the future study of Asian American literature for some time to come. The book will find its readers among scholars in a wide range of fields, such as Chinese literature, contemporary English poetry, comparative literature, and culture studies.